It’s Monday morning, and I returned a short time ago from my run. Since my vacation at the end of September that stretched into the middle of October, I’ve been getting up around 4:30. (All my life I’ve been, bon gré mal gré, a morning person.) I love the quietness of that time of day when I can actually hear myself think. Getting up early, I start the day by writing my Morning Pages, then head out for a run. 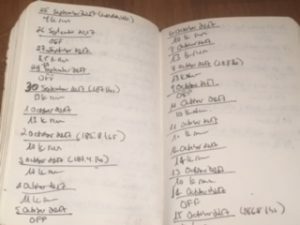 In the middle of September, I was inspired by a colleague (he’s completed the Iron Man Triathlon) to challenge myself more when it came to running. I’d been in a “rut” of putting in four-kilometre runs. Working slowly but steadily, I increased my distance from four to ten kilometre; the latter has now become my minimum running distance. My workout/running journal, which I’ve been keeping since July 1, 2015. The point is this. For me, there are a lot of parallels between running and writing. To improve in both, you have to show up regularly. Depending on my work schedule, I run four to five times a week. I write every day. There are days when I don’t feel like writing or running, or when the writing feels stale or that I’m running uphill. There are days when I don’t feel like I have the courage, or the will, to carry on. There are days when I doubt my talent as a writer and my ability as a runner. I forget just how far I’ve come over the years. Now, I’ve already chased away my Monday morning blues. I’ll be brave and keep on doing what it is that I love to do. What about you? When you’re in need of a little dose of inspiration or motivation, what do you do? Do you have a favourite quote or quotes that you turn to? Let me know in the comments section below. Same wavelength, as usual. I came into running in my later twenties and completed my first half marathon last year before plantar fasciitis sidelined me for a while. I’m recovered now and looking to get back into it but. . . I grew up a swimmer, competing year-round for about nine years. I think the discipline of showing up every day to practice prepared me for a lot of life’s challenges (including being a writer). I think endurance sports are really unique in this regard—there is a constant discomfort to work through that makes us stronger. Good luck with that Iron Man! There is a constant discomfort to get through. Sometimes that “discomfort” can simply be a hesitation to show up, or us wondering if we’re on the right path. We work through those kinks when we show up to run, write, swim or create, and we do indeed become stronger.